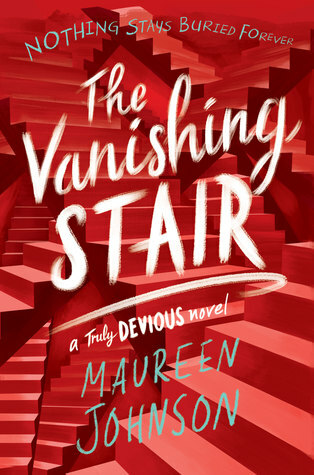 🌟 The Vanishing Stair was what I expected it to be; an unnecessary bridge to the third book and this whole series could have been a duology. Yes, this book fell into the second book syndrome with much blabber and not much happening till the end! 🌟 I enjoyed book 1 more than I did with this one because there were much to explore in it and not much to do so here! I read the 2 books in January so I didn’t have to go through that excruciating waiting that most of readers went through. I was slightly disappointed with how things carried on from the start. After the ending of book 1, you would expect a better beginning than the one this book had. 🌟 My feelings toward the characters did not change, I am not a big fan of any of them but I stand corrected on one point; I mentioned on my review of book 1 that the characters should be better given that it is a school for the best of the best. I don’t know how it escaped my attention but really, most of the students in the school were there as friends of the owner or they are connected to him in that way whether in the past or present! 🌟 There wasn’t much happening and I got bored, the last chapters were good and maybe it is because things finally happened then and we got an explanation to one of the mysteries. 🌟 Summary: This book was like book 1 in terms of characters, writing and the world-building. Less happened but we got ourselves some answers at last. I am not convinced in the contemporary/ Mystery mix but I am willing to read the last book when it is out! This is the biggest truth ever. The first 40% of the book was so BORING and I just didn’t CARE, I almost DNF’d it because I was so annoyed and disappointed. (Also of note, I re-read Truly Devious before starting this and… didn’t enjoy it as much, they are both fluffy and could have been combined into one, stronger book.) Great review. I know, I haven’t been a big fan of the whole series. But I am willing to read the third book because I am still curious! Yea I definitely want to know how it ends!